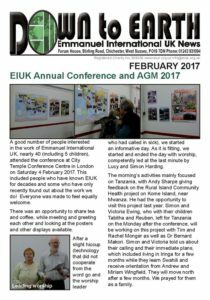 Read the report on the Conference, including reviews from those who attended. More than 10,000 girls and 100 schools have been reached with the Pads Ministry, helping girls to manage their menstruation and keeping them in school for longer. A reminder that we can claim Gift Aid if you meet the requirements, and also to let us know if your tax status changed! Make a note of the date of the Summer Event : Saturday 8 July!